Because it's easier to blog your kids' life than to glue a book together. ahhhh yeah, nice :) was joey happy under there? He was until Milo sat on it. Then he cried. Then they traded places but Milo's legs were too long and stuck out of the bottom. 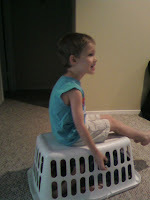 So when Joey sat down the edge of the basket was crushing Milo's leg. HA! Funny how you can snap a pic at the right moment before it all falls apart. Go, now! Enjoy life! Hurry! Glitter toothpaste is an awesome teeth-brushing motivator! We love kids, we really do. 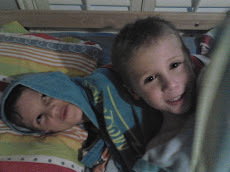 We want to remember the good, the funny, and the odd that our kids are/do/be/will. And, we're lousy at making "baby books/scrapbooking." Curious? Read on, my friend, read on. We're the cool kids your parents wish you were.